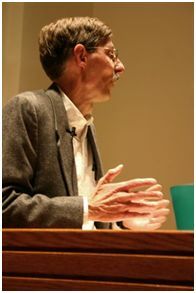 Richard St. John is a nationally-published poet whose books include Each Perfected Name (Truman State University Press, 2015), The Pure Inconstancy of Grace (published in 2005 by Truman State University Press, as first runner-up for the T. S. Eliot Prize for Poetry), and Shrine (a long poem released as a chapbook in 2011). His work has also appeared in numerous periodicals and anthologies. He has read widely across the country, connecting not only with literary audiences but with listeners new to poetry. You can hear or read some of Rick’s poems and see reviews by clicking Media. Rick also facilitates Conversations That Matter, small group gatherings that support connection, reflection and shared meaning-making. Rick would love to hear from you. Click on Let’s Connect to share a comment, schedule a reading or a class visit, request an informal poetry conversation, or participate in Conversations That Matter.